I'm extremely disappointed with these gloves. I got either counterfeit or 2015 model. It has cheap, rough leather on the palms. The lining is also lower quality than the original. Shortly the gloves that i received are completely different than those pictured. And yes I had the original gloves but returned them because of wrong size. Decent glove, repels the rain but not the cold. I'm reluctant to call these winter gloves as my fingers got pretty cold in 45F and below. I'll be using them as fall/spring gloves here in Seattle. They definitely repel the rain, not so much wind and it lacks sufficient insulation when I squeeze my brake (metal) levers that's where I get a lot of the cold transfer to my fingers. I thought the lack of the cuff wouldn't bother me, but I think I prefer to have a cuff for a tad more coverage up the sleeve. I generally wear mediums, the large was too big and the medium is too small. Could be good gloves for someone, just not great for me. Gloves keep you warm and dry in 40 degree F. Too warm for 53 F and above. Nice and thin, easy dexterity for shifting and braking, not bulky. Nice glove at a good price. 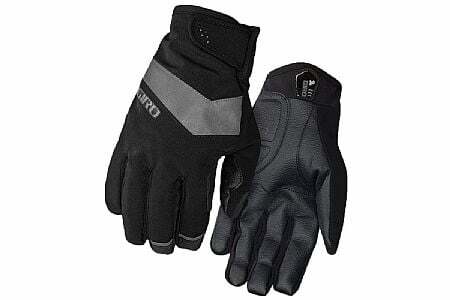 These gloves are waterproof, relatively warm to the low to Mid 30's, appear well constructed. I bought a large, but they seem to run a bit small in the finger length. I like them because they don't have a long cuff, but that is personal. Good warmth, waterproof and flexability. Using in 20-30F deg. I always struggle to find a good cool weather glove that I wont overheat in when it warms up, but keeps me warm when it's bone chilly. I actually have really sensitive hands from some circulation problems, so still when it gets down below 29 degrees, I'm not sure if these are enough, but for normal PacNW commuting they provide me with a good range from 35 degrees to 48 degrees before I really start feeling too warm. Great construction, waterproof, and well worth the added money. I justified this to my wife with a you get what you pay for and I paid for a good, quality glove. Good flexibility and warmth. Have not had a chance to try in heavy rain yet. Wore these at Cross Crusade in Bend in December, 'nuff said. It was bouncing between 0F and -5F with the windchill when the whistle blew to start the race. I was gonna totally bail when it -22 when I woke up, but with these gloves with a couple of chemical warmers shoved in them I didn't feel the cold. If anything they may have been too warm instead. Since then I've been using them for commuting on cold mornings, anything warmer than 30 though and your hands are going to sweat. So far windproof and water proof, they worked well enough, I'm pretty picky about gloves and their fit. My wife bought a pair just like them also and wears them all the time. I have been using Giro's full finger and half finger gloves for years. They fit and perform better than any other gloves I've tried. Thus, I assumed that their winter gloves would have a similar level of refinement. I was wrong. These Pivot gloves fit very strangely. The hand is very small and tight, I couldn't get a large on at all, though I wear a large in their regular gloves. The fingers are ridiculously long and the inch and a half extra leaves no dexterity for shifting. If that wasn't enough, the inside lining is some kind of thermal pattern which digs into your hand after a few minutes of riding and becomes very uncomfortable in less than an hour. Despite all this, I rode with them anyway, hoping that a little break-in period would allow me to get used to them. I finally gave up on these gloves because the palm, while seemingly durable, offers no grip what so ever. My hands were slipping all over the bars and off of the brake levers. If you're looking for winter gloves that you can actually use, look elsewhere. I bought these for my early morning harley riding to work and they do the job well. These are the best very cold, very wet weather glove I have worn. I have different gloves for different seasons, so these are the November-March gloves when the temps are consistently cold and wet. The are too warm for temps over 50 degrees and I generally don't wear them for fitness rides unless it is below 35 andor raining. That said, they offer good finger feel and are fine for road riding on the hoods when you need good control. Sizing seems to run a bit small, I usually wear a Medium, but went with the Large for these gloves. I have been very satisfied with these gloves in weather down to freezing. They are comfortable, allow for good freedom of movement, warm and attractive. So far they appear to be plenty durable. Great gloves but not when it drops below freezing. I've been on a search for winter riding finger gloves, and these gloves perform great until it goes below freezing. But, I haven't found a bicycle fingered glove that performs well below freezing because if you expect warmth, you don't get the dexterity that a bicycle glove provides. I have concluded that I should not expect warmth in a fingered bicycling glove at temperatures below freezing. The Giro Pivot winter glove provides adequate warm down to freezing, and still allows exceptional dexterity to shift and apply breaks. I give it 5 stars to this degree. Recently, when the temperatures reached the low 20 degrees F., I was forced to use my downhill fingered ski gloves. The compromise is that the ski glove is bulky, but it keeps me rolling and smiling at 20 degrees F.